The evening started with some bad news - Arkona weren't going to be playing. We heard later that this was due to visa problems which prevented them getting into the country. Still this disappointment aside we still had a good lineup to look forwards to - Skálmöld, Trollfest, Alestorm, Finntroll and Turisas. The plus side was that the reduced number of bands meant that the show kicked off an hour later than originally planned, which gave more fans time to arrive and meant that the venue was pretty full right from the start. The evenings entertainment kicked off with Icelandic band Skálmöld. Playing in front of a large crowd their heavy folk metal sound impresses a lot of people here tonight and will definitely have earned them some new fans. Next up were Trollfest. For some unknown reason the singer came out in a Beer Bottle costume which he wore for the first song before taking it off (he must have been roasting in that outfit as the venue was hot enough anyway). Trollfest were a lot heavier than Skálmöld - almost a thrash metal sound rather than folk metal, but thrash with the addition of a saxophone and an accordion. Although they went down ok with the crowd they certainly seemed to get the most muted response of the night. Next up were Alestorm. A huge cheer went up as the bands backdrop was hoisted as the stage was being prepared. Alestorm had a lot of fans in the venue - the crowd could be divided into three equal sized groups - those with Turisas face paint, those in pirate outfits, and those who didnt sport either a costume or face paint. Alestorm put in a great performance that the crowd go crazy for. For Keelhauled there are several crowdsurfers to keep security busy. Alestorm may be typecast as a pirate metal band but its clearly very popular with the fans and that's what really matters. Next up were Finntroll. With the crowded venue and the fast changeovers from a very efficient stage crew, it was a struggle for fans to get to the toilet and then the bar and back to the front between bands, so as the lights went down for Finntroll there were plenty of beer laden fans desperately trying to get back to where their friends were before the music started. In the UK Finntroll are one of the best known folk metal bands, thanks largely to festival appearances, so its no surprise that they go down very well with the fans tonight. The night ended with the headliners Turisas. 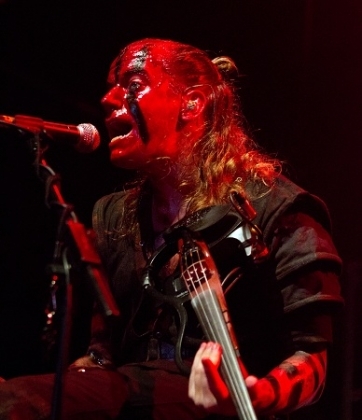 Although Finntroll are one of the better known folk metal bands, Turisas are a lot more popular in the UK, so although Finntroll are headlining Heidenfest on the rest of the tour, Turisas are headlining the UK date. Tonight Turisas can do no wrong as far as the fans are concerned (their lighting engineer on the other hand caused much grumbling among the press photographers with the poor lighting and excessive smoke machine use). Songs such as "One more" get the crowd singing along early on in the set and with popular choices "Rasputin" and "Battle metal" coming later, this was a great night's entertainment. Heidenfest 2011 was a great success here in London, with its really strong lineup of bands - lets hope they bring it back next year, and hopefully they can get Arkona into the UK next time.